The Cycling Ireland team has been announced for the UCI 2018 Para-cycling Road World Championships in Maniago, Italy from the 2nd – 5th August. Six bikes will compete across twelve events over the four days of action. 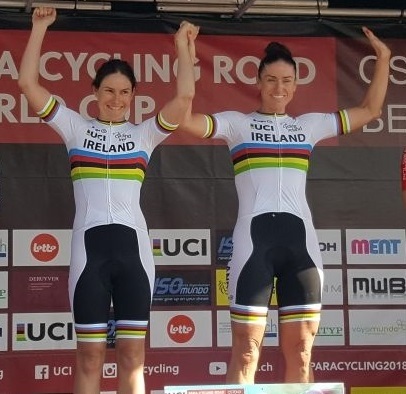 Reigning World Champions in the Women’s B Tandem Katie-George Dunlevy and Eve McCrystal, will be competing in the time trial on Friday 3rd August, and in the road race on Sunday 5th August with the aim of defending their titles. The Irish women are on the right track, standing on the podium at both World Cups this year. Dunlevy competed with Jennifer Bates at the last World Cup in Emmen, winning a silver and a bronze medal. The duo of Peter Ryan and Séan Hahessy will be competing, they finished fourth in the time trial at the last World Cup in Emmen, and fifth in the road race, and sixth in the previous World Cup in Belgium. The tandem of Damien Vereker and Dermot Radford are also in action. Paralympic silver medallist Colin Lynch will be competing in the Men’s C2 races, and Ronan Grimes in the Men’s C4 categories. Grimes won a bronze medal in the first World Cup of the year in Ostend, Belgium, in May. Paralympian Declan Slevin will be the sole handcyclist in action in Maniago and will be the first rider to compete at the World Championships, in the 13.6km Time Trial on Thursday 2nd August. “We are expecting a very high level at this year’s UCI Paracyling Road Worlds in Maniago. Most Nations have stepped up their programmes this year in the hunt for Tokyo qualification points. This competition will see the culmination of a lot of that focused effort. We are anticipating every race to be hard fought and we are ready for the challenge.